Defence Research and Development Organisation (DRDO) invites applications for the posts of Senior Technical Assistant ‘B’. DRDO has released the official notification for filling 494 posts of STA ‘B’ through DRDO Entry Test-2018 in various subjects/disciplines. Last Date of Online application submission is 29 August 2018. DRDO offers exciting and challenging career opportunities to work on defence systems, infrastructure & related activities in a broad spectrum of subjects/disciplines at its more than 60 laboratories/establishments spread throughout the country. Agriculture 04 B.Sc. Degree in Agriculture/Agriculture Science from recognized University / Institute. Automobile Engineering 06 3 Years Diploma in Automobile Engineering from recognized Technical Board/Institute. Botany 03 B.Sc. Degree in Botany from recognized University /Institute (candidates of ZBC etc. may also apply). Chemical Engineering 13 3 Years Diploma in Chemical Engineering / Technology from recognized Technical Board/Institute. Chemistry 24 B.Sc. Degree in Chemistry / Chemical Science from recognized University /Institute (candidates of PCM/ ZBC/PCB etc. may also apply). Civil Engineering 04 3 Years Diploma in Civil Engineering from recognized Technical Board/Institute. Computer Science 79 B.Sc. degree Or Three years Diploma in Computer Science/ Engineering/ Technology/ Information Technology from recognized University/ Technical Board/ Institute (Courses by DOEACC/BCA/MCA are not eligible). Electrical & Electronics Engineering 16 Three years Diploma in Electrical & Electronics Engineering from recognized Technical Board/ Institute. Electronics & Instrumentation 07 Three years Diploma in Electronics & Instrumentation from recognized Technical Board/ Institute. Electronics or Electronics & Communication or Electronics & Telecommunication Engineering 100 B.Sc. degree Or Three years Diploma in Electronics or Electronics & Communication or Electronics & Telecommunication Engineering from recognized University/ Technical Board/ Institute. Geology 03 B.Sc. degree in Geology from recognized University/ Institute. Instrumentation 05 B.Sc. degree Or Three years Diploma in Instrumentation or Instrumentation & Control Engineering from recognized University/ Technical Board/ Institute. Mathematics 08 B.Sc. degree in Mathematics from recognized University/ Institute (candidates of PCM etc. may also apply). Mechanical Engineering 140 Three years Diploma in Mechanical Engineering or Mechanical Engg (Production/ Automobile/ Refrigeration/ Air Conditioning/ Maintenance etc.) from Technical Board/ Institute. Photography 02 B.Sc. degree Or Three years Diploma in Photography or Cinematography (Vocational Photography & Cinematography) from recognized University/ Technical Board/ Institute (Applied courses and Bachelor in Fine Arts are not eligible). Physics 16 B.Sc. degree in Physics from recognized University/ Institute (candidates of PCM/PCB etc. may also apply). Psychology 05 B.Sc. degree in Psychology from recognized University/ Institute. Candidate must be between 18 and 28 Years of age (relax able for SC/ST/OBC/ESM/PWD etc. as per Govt. of India rules). 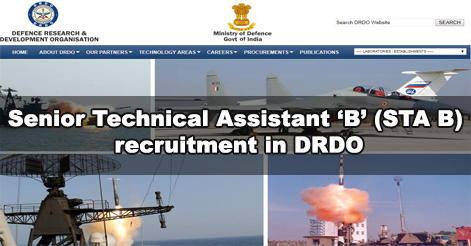 Eligible candidates can apply online through the link available on CEPTAM notice board (https://www.drdo.gov.in/drdo/ceptam/ceptamnoticeboard.html). Candidates can apply online only from 04 August 2018 to 29 August 2018 and no other mode of application will be accepted. Non-refundable application fee of Rs.100/- (Rupees one hundred only) is to be paid by the UR and OBC candidates. All women and SC/ST/PWD/ESM candidates are exempted from payment of application fee. The fee should be paid separately for each post code applied. Selection of candidates will be based on DRDO entry test in two tiers: Tier-I, Tier-II & preliminary document verification. Note: Tier-I exam is for screening & the medium for examination will be Hindi or English. Note: Marks will be normalized in Tier-I & Tier-II examination. Help us to improve this article/job posting "494 Senior Technical Assistant ‘B’ (STA B) recruitment in DRDO". We would be glad if you can comment below and provide your valuable suggestions and feedback. If this page have any wrong information/list or out of context content, then you can report us as well. Is there any vacancy for ex servicemen? kindly tell about the attempts and how we know about the job profile in drdo with subject specification? if a bsc chemistry student will qualify the exam for the same then what will be his/her job profile and job description there in drdo? Where will be the centre of examination? I hv completed my BCA course, am i eligible for computer science pls reply…. I have pursued diploma and be in 2017 can I apply for this post? Four year engineering degree students are eligible or not? I am a B.E. / B. Tech. Am I eligible for the STA „B‟?